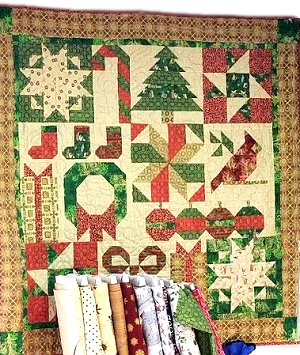 Quilted Memories and Paintbrush Studios thank you for your patronage with this delightful sampler; "Silent Night"
Program begins April 15th with 13 blocks published one each week. Each new block pattern will be sent by email. If you signup after April 15th we will send you the previous blocks you missed. The finished size of this quilt pattern is 54 inches x 54 inches. Work at your own pace to complete this quilt. Wishing you a wonderful New Year in 2018. Enjoy the free patterns! The Teams at Quilted Memories & Paintbrush Studios! The original design is by Lisa Ruble/Paintbrush Studios. The patterns were adapted by Judy Brennan/Quilted Memories for this offering.